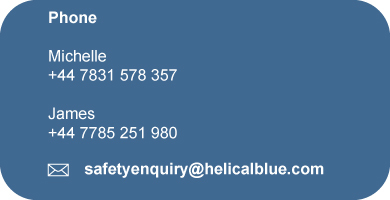 You can contact Helical Blue Consulting using the contact form below and we will get back to you. Or please give us a call to discuss the health and safety consultancy services we offer. GDPR - By contacting us you confirm that you are consenting to provide us with your name and email address. We will only use this information for communicating with you regarding your enquiry. We will not share this information or retain the information if you do not wish to use our services any further. We do not use this data for marketing or sharing with third parties.